And the car wouldn’t start……. We were up early, feeling the travel fever. Made a nice breakfast and packed a good lunch. Checked out from the hotel and had already organised transport down to the port with all our equipment. And the car wouldn’t start…… Luckily Erni and Naja Nuka came with their kids to say goodbye. They had a large car and we came down to the port in time. Fantastic boat trip to the glacier. The ice covered the innermost part of the fjord and the captain just drove the boat right up onto the ice! This was unexpected but worked a treat. He anchored the boat with an ice pick and we unloaded all our equipment. When the boat left it was strange to think that we will only see each other for the next few weeks. We could walk on the ice in to the ascension point. It was difficult to find the route. 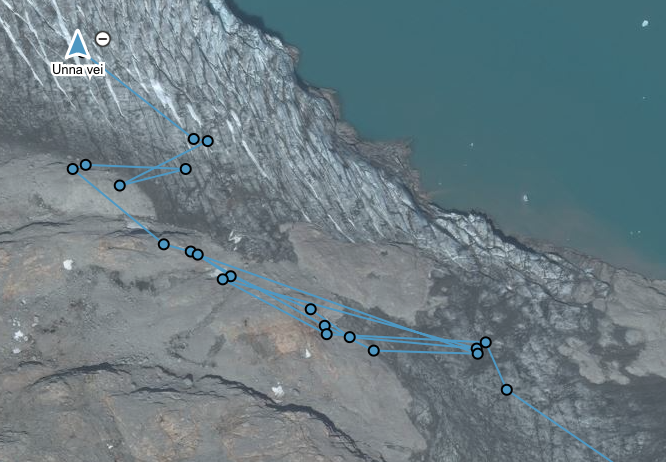 There is a reason it says “Unexplored” on the map , and since the glacier had receded more now than earlier we had to find a route ourselves. We ended up walking 30 meters higher that we needed and had to lower the sleds down one by one. This took time and energy. It was good to be on the inland ice and relax. Our bodies had worked hard, but were in good shape. Our routines worked well and we are happy in our tent. Good food and lots to drink as we travel. It’s the first weekend in January. A lovely Christmas break has ended. I have trained to pull a sledge on skis. A little Nora at 2 ½ years does not weigh that much, but when everyone is happy not to have to carry the bag – then it suddenly becomes a very heavy sled. It was good! The sled stand to be very very heavy on the trip. Nice to get adjusted the level of expectation. It’s heavy and we will not go fast! We take the early train up to Finse. My job is currently relatively quiet. All consultants are waiting for the client to get started after the Christmas holidays. Tommy is busy. Worked at half past one in the night and up again at 5 to pack… But now we’re here. Cant wait to see the kites in the air. It was hectic to get on the train. I ran in to the shop to grab some groceries while Tommy loaded our equipment on the train. We’ll take the rest of Finse we thought, it is so nice to sit by the fireplace with a glass of wine or a cup of coffee and look out at the winter outside the door. Great atmosphere! It is dark when we arrive, then there will be no opportunity for a kite session Friday… oh well. We have a lovely long weekend ahead of us. A short drop by Ronny Finsås to say ‘hello’ at our arrival, afterward we settled ourselves in the apartment of the Red Cross. A quick dinner and watching TV. The chat is lively and circulates continuously around the expedition. We take an early night. Oh, no! 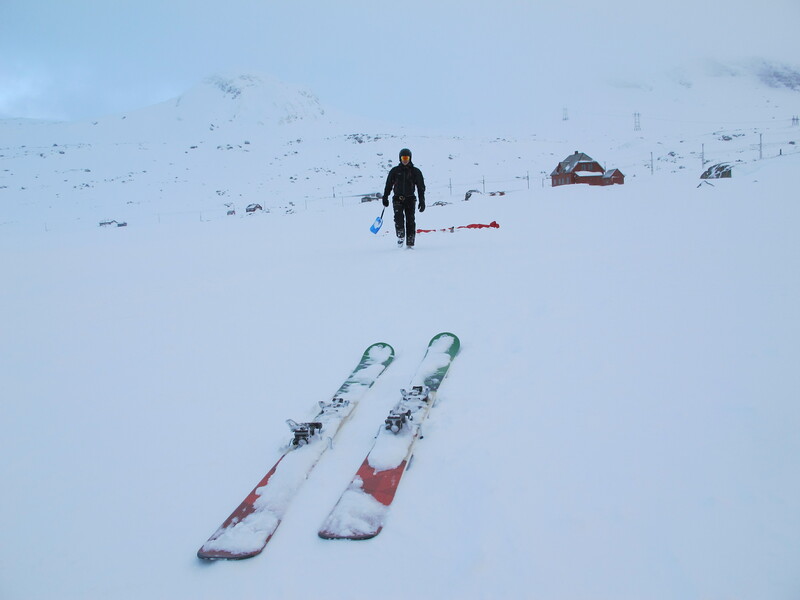 Both the Finse cabin (DNT) and the1222 Finse hotel are CLOSED! Hmmm. We don’t have any food. That problem will we have to address later, cause now we’re going out on the frozen water and the kite. My kite Ozone Frenzy 8 sqm is perfect for the weather. I unfold the kite, put snow on the edge. Rolls out the lines and attach the bar to the harness. I’m ready. When I pull a little in the lines the wind fills the canals of the kite with air and it rises from the ground. I stand ready on my skis and tilt the kite over to the side, it responds instantaneously and drag me away. Aaaahhhh… It is so delicious! It tickles in my stomach, a dream to fly like this across the Finse water. The first kite session in this winter season. 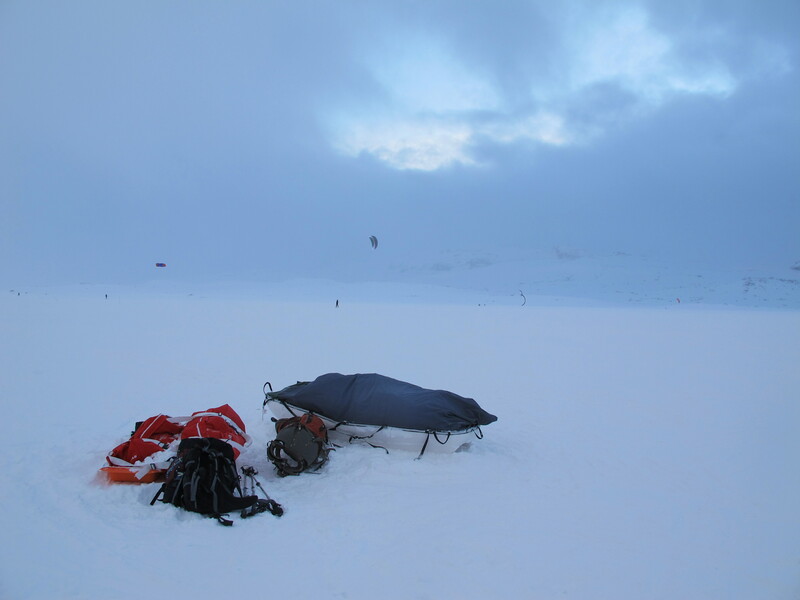 Our expedition, Unnavei, will kite Greenland lengthwise. There is only a small catch, Tommy must learn to kite first! Tommy is assigned a kite from Ronny. He received instructions and shortly after hovering a 3 sqm kite in the air. The basic technique is developed quickly. He advances to a 5 sqm kite and puts on his skis. Now he flies over the water. We meet in the middle of the Finse water. Tommy is laughing out loud and enjoying themselves. “Oh, this is goill” says Tommy. “Much better than expected” . I stand again as a large question mark. Had he really planned to kite Greenland along without believing that it was incredibly fun kite ? ? ? A quick shower and we are heading over to the Telenor cabin where they live. Here are both after kite, beer, and delicious food fragrances. We benches us around the long table, a total of 7 hungry people around the table. The chat is all about kiting, expeditions and Greenland the entire evening! This was fun. Ronny and Tom also comes over to the lodge in the evening. They kited Greenland in 2009. Torstein 12 years, kited for the first time today, falls asleep on the couch -exhausted. 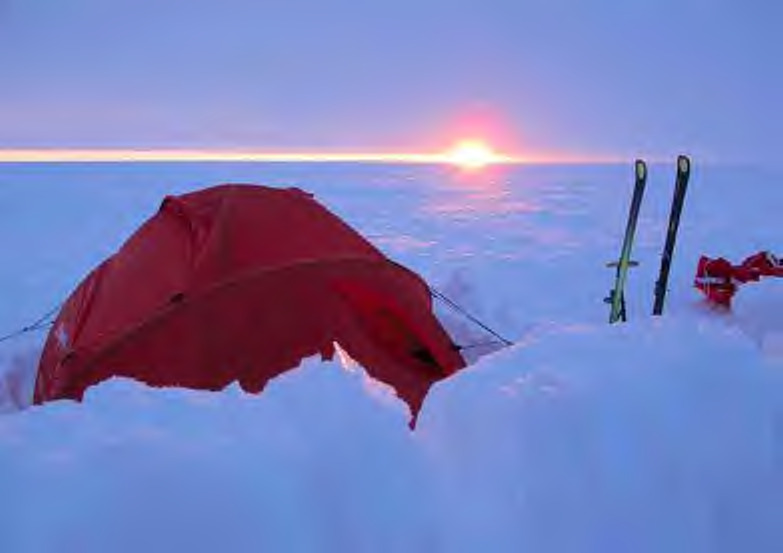 We continue to talk about kiting, expeditions and Greenland. What a happy evening! Sunday we are first on the ice. Too much wind to kite. 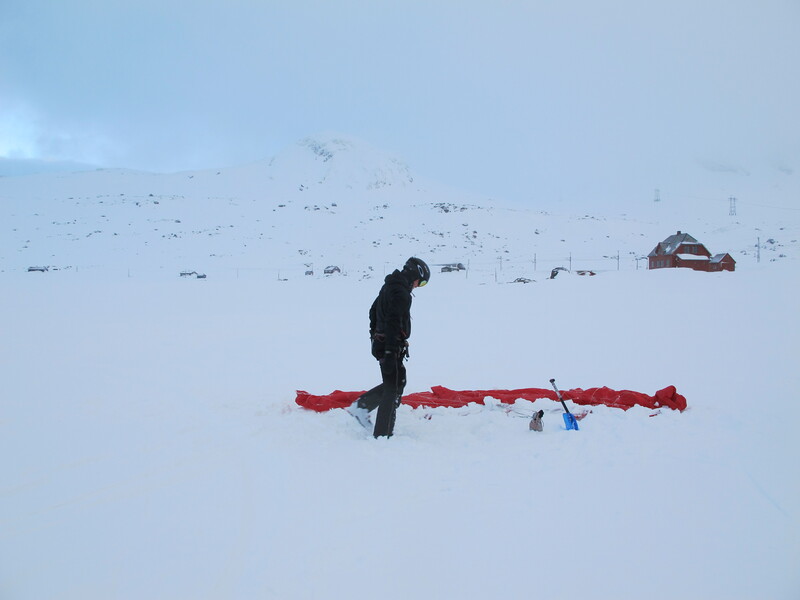 We find our ski sails, three square meters, it goes fast! The wind is very variable throughout the day. We pull out a kite each. Whizzes around. More people joins us on the ice. Suddenly it blows up sharply. The wind is uneven. The kite is jerking and struggling. It lifts me up even when I try to keep it quiet. It descends surprisingly towards the ground until it juts up. It is impossible to control. We both struggle to secure the kite and pack it. This is good training for our expedition. We are walking back across the water. Satisfied with their own efforts in the wind. We use the ski sails again. Tommy tests out to sail with sled. Smiling from ear to ear. I’m heading in to warm myself and eat some lunch. Tommy continues. I follow him from the window. Suddenly he’s gone! I search and look. Being a little stressed, but then suddenly he pops up from a pile of snow. He runs the terrain! This is good. When darkness comes creeping, Tommy eventually enters inside too. Super Happy! 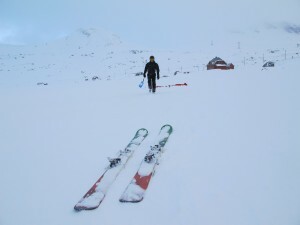 What a great kite weekend we’ve had at Finse. Thank you to all the wonderful people who open their homes to us. Our hearts are full. And thank you two Roy Precht for good advices editing this video on the train home from Finse!